The history of Maine’s brief, but intense, association with the Ku Klux Klan is becoming increasingly well-known. Along with a large portion of the country in the early 1920’s, Maine was home to a Klan chapter with a significant membership, which held significant sway over local politics. While the Klan had its beginnings with former Confederate army officers in the South, and initially targeted African Americans in former Confederate States, by the 1920’s, the “second Klan” had broadened its agenda of hate to include Jews, Catholics, and almost any immigrant. In Maine, from 1923-25, the KKK whipped up animosity against the state’s significant Irish- and Franco-American populations, in particular. What’s less well covered is the resistance to the Klan and their divisive brand of politics by the groups they attacked. While the group had successes in eliminating Portland’s directly-elected mayor, and a number of other local races, they never completely captured state politics, and their influence diminished rapidly after 1924. US Senator Owen Brewster, who was elected governor in that year, was often accused of courting the Klan vote, but this association has never been proven. Brewster certainly had a record of contesting the right of immigrants to vote, and the KKK itself endorsed his candidacy, but Brewster himself consistently denied being a Klansman, or supporting the group. That the KKK were not able to capitalize on their initial successes is credit to the efforts of Franco-Americans and others to stop them. Parade of the Ku Klux Klan in Milo Maine, September 3rd, 1923. Said to be the “first daylight parade in USA” – a sign of the group’s confidence. Image: Island Falls Historical Society/Maine Memory Network. Labor unions also fought back against the KKK, and sought to organize the very immigrant workers the Klan demonized. On February 2, the KKK tried to evict an organizing group of the Industrial Workers of the World (IWW) in Greenville. About forty Klansmen went to the boarding house where IWW delegates were staying, and tried to intimidate them into leaving town. In response, the IWW called in its local members – who were mostly woodsmen – for a show of support. On the sub-zero night of February 4, nearly 175 union members, many of whom were Franco-Americans, marched in Greenville to oppose the KKK. IWW leader Bob Pease accused the Klan of working with the lumber companies, town selectmen, and the local YMCA to try to oppose the unionization of lumber workers. 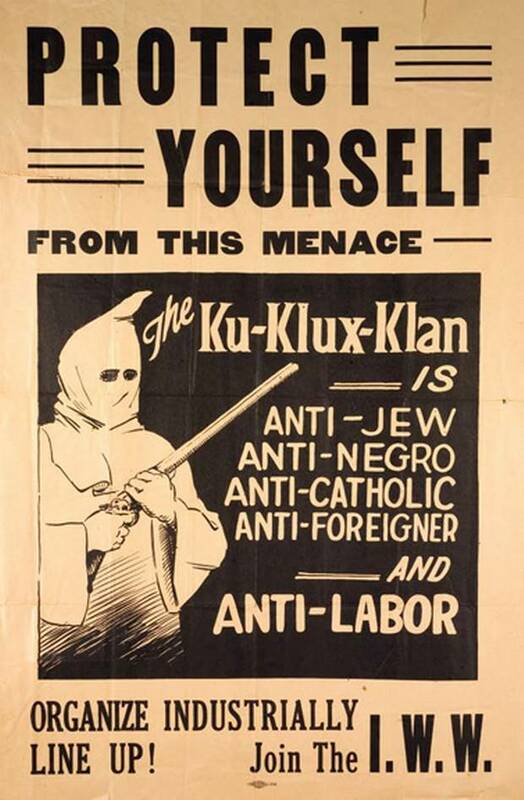 Anti-KKK poster by the Industrial Workers of the World (IWW), 1921. Sometimes, however, Franco-Americans did not have the protection of local governments or the strength of labor unions to help them. A July 1st gathering of Klansmen in Fairfield (just south of the Franco-American stronghold of Waterville) was disrupted by unnamed local “youth” who threw stones at the Klansmen’s cars. The brief gathering was broken up by about 200 locals, who far outnumbered the fifteen or so Klansmen. No-one was injured, but a sign of the KKK’s prominence in the town can be found in the account of the incident found in the Waterville Morning Sentinel of July 3rd, 1924. The injured Klansmen included “a local businessman” and at least one individual known to the police chief. Franco-Americans and other minority groups are often depicted solely as victims of racism and discrimination. Not to acknowledge the steps these groups took to oppose bigotry is a mistake that undervalues their agency, and contributions to their own struggles. One of the lessons of the rise and fall of the KKK in Maine is that racism and hatred can be opposed when we stand up together and fight back.